Defense Secretary Leon Panetta's decision to lift the 20-year ban on women serving in combat will open some 237,000 combat-related positions to women. 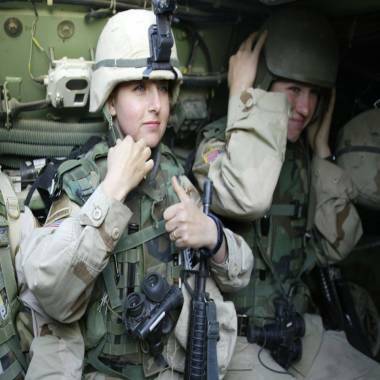 Initially, women will be assigned to combat communications, logistics and drivers. NBC's Jim Miklaszewski reports. U.S. Defense Secretary Leon Panetta has decided to clear the way for women to serve in many combat positions in the U.S. armed forces, a senior defense official told NBC News on Wednesday afternoon. The Pentagon chief will announce on Thursday that he is eliminating the direct ground combat exclusion — the Department of Defense policy that excluded women from assignment to units below the brigade level if the unit would be engaged in direct combat. This will allow women to be assigned to select positions in ground combat units at the battalion level, opening approximately 237,000 individual jobs to women across service branches, including 5,000 positions for female Marines in ground combat elements. "I support it. It reflects the reality of 21st century military operations," said Sen. Carl Levin, D-Mich., chairman of the Senate Armed Services Committee, in anticipation of the announcement. "We are moving in the direction of women as infantry soldiers," one senior defense official said. Longstanding opponents of lifting the ban on women in combat lambasted the move as a show of "political correctness." "The point of the military is to protect our country," said Penny Nance, President and CEO of Concerned Women for America Legislative Action Committee, a conservative lobbying group. "Anything that distracts from that is detrimental. Our military cannot continue to choose social experimentation and political correctness over combat readiness. While this decision is not unexpected from this administration, it is still disappointing." Panetta, who is expected to leave his position as Defense Secretary in February, will call on the military services to study whether it is possible to open all jobs to women, and the services must come back with their individual plans and recommendations by May 15, a senior defense official said. He will call for all changes to be in place, and women serving in the new roles by Jan. 1, 2016. But a senior defense official who spoke to NBC News said they expect exceptions to remain. Elite Special Operations positions in Navy SEALS, Army Rangers, and Delta Force were likely to remain closed to women, the official said, while the Army is likely to open up jobs for female pilots in the elite 160th Special Operations Aviation Regiment. Female soldiers from the US 1st Cavalry on patrol in Baghdad's al-Jihad quarter in this Mar. 21, 2004, file photograph. Sen. Patty Murray, D-Wash., called the decision "historic." "In fact, it's important to remember that in recent wars that lacked any true front lines, thousands of women already spent their days in combat situations serving side-by-side with their fellow male servicemembers," said Murray, who heads the Senate Veterans' Affairs Committee. In November, a group of women in the military and the non-profit American Civil Liberties Union sued the Pentagon over the policy of excluding women from combat roles. Their complaint argued that they were already serving in combat roles, but not getting recognized for it. So far, 152 women have died while deployed in support of the wars in Iraq and Afghanistan and at least 958 have been wounded in action. "This is really the implementation of a policy that has been a reality for women for years," one senior defense official said. According to the most recent Defense numbers, there are 1.4 million active duty members of the military, and nearly 15 percent of them are women. This new military-wide rule — distinct from a law — will replace the 1994 policy memo barring women in combat roles, which was signed by then-Secretary Les Aspin. NBC News correspondent Kelly O'Donnell and NBC staff writer Kari Huus and The Associated Press contributed to this report.